Tetris Blitz meets Flow in the Dots: A Game About Connecting iPhone, iPod Touch, and iPad app. Filled with great graphics, agile interface, and straightforward game play, you will be quickly addicted to this free download from the iTunes App Store. 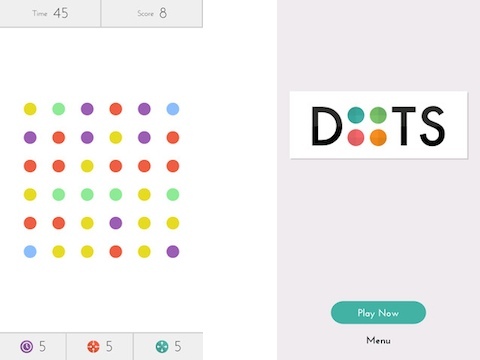 The introduction to the Dots: A Game About Connecting iPhone app is a combination of concise directions and gesture-controlled game play. The happy, inspired tone of the directions and copy throughout the dots iPhone app add unexpected fun. The gesture controls are simple–you connect dots of the same color. You get a chance to play with these features prior to starting your first game. The game play is simple. You must connect as many dots in a grid as possible in 60 seconds. You must also keep in mind that you must connect dots of the same color. You use accurate horizontal and vertical gestures to connect them on your screen. As you connect dots, the connected dots disappear and the matrix of dots instantly changes. Existing dots slide down to fill in missing dots, and new dots drop into the matrix from the top of the screen. To maximize your chances of finding multiple colored dots in a row that may be connected with one swipe, you need to wait until the sweet spot. The sweet spot is the moment when all of the adjustments to the game’s grid has occurred. It is hard to wait, as you will surely find two dots here and there that you can quickly connect. You earn points as you connect dots. You can also use power-ups to improve your performance. The power-ups are located just below the grid. The red dot allows you to double tap a dot to make it disappear. A tap on the teal dot gives you the chance to remove an entire color from the grid. The purple clock icon suspends the clock for a five second interval. As you complete games, you earn trophies and can check out a quick glimpse of your performance. This is not a game where you feel like you’re competing against the Game Center leader board. Instead, you are really competing against yourself. An additional smart move by the development team is to provide a bonus prize to users as a result of a problem with the latest update. It is great marketing and customer service to acknowledge a bug, as well as extend a token of appreciation during the update. The Dots: A Game About Connecting iPhone, iPod Touch, and iPad game app is well-executed, visually stimulating, and great fun. AppSafari review of Dots: A Game About Connecting was written by Jenni Ward on July 18th, 2013 and categorized under App Store, Arcade, Free, Fun, Games, iPad apps, Puzzler, Universal. Page viewed 5525 times, 3 so far today. Need help on using these apps? Please read the Help Page.